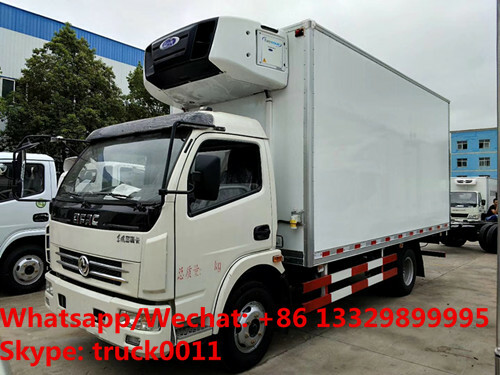 Dongfeng RHD refrigerated truck for frozen meat, adopts Dongfeng RHD chassis, dongfeng RHD 2025mm single row driver cab, 3800mm wheelbase, 5 speed transmission, 7.50R16 tyre, 2.4ton front bridge/4.2ton rear bridge,chaochai 120hp/Cummins 140hp diesel engine, power steering, air-cut brake, electron extinction, Camel brand storage battery, etc. The real load of the dongfeng RHD refrigerated truck is 6ton-8ton. strengthen, etc. the middle is PU slices with vacuum negative pressure one-formed casting, and the thickness is 8mm, approved the related Ministry of Health of food grade requirements, etc. just like sandwich structure. The refrigerated van has the advantages of high strength; strong anti-corrosion and aging resistance, low heat-conducting property, non-pollution, non-easy destroy, etc. And the baseboard is aluminum alloy anti-skipping diamond board, which assuring the insulation ability and the compact resistance of the baseboard. There are aluminum alloy ventilation slots on the baseboard. The frame of standard rear double doors adopts the stainless steel structure frame with light mass and perfect corrosive resistance, etc. The door edgings frames are sealed with the imported high quality epdm rubber, making sure the van insulation stability. Door edgings, door locks and accessories use stainless steel materials. If installed the meat hangers, the whole refrigerated van should be fastened. And the meat hangers are with double sides to hold one pig. 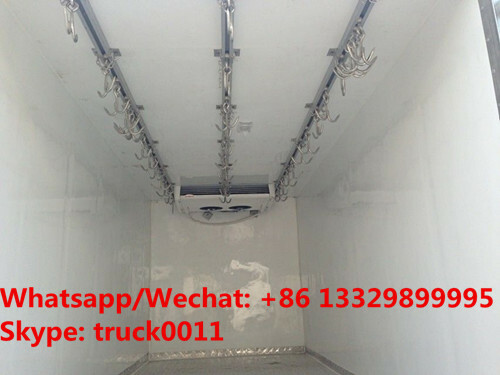 If you're interested in our cold room truck, please send email to szhj9999@163.com or talk to Anita by Whatsapp/Wechat/Mob. :+86 13329899995. 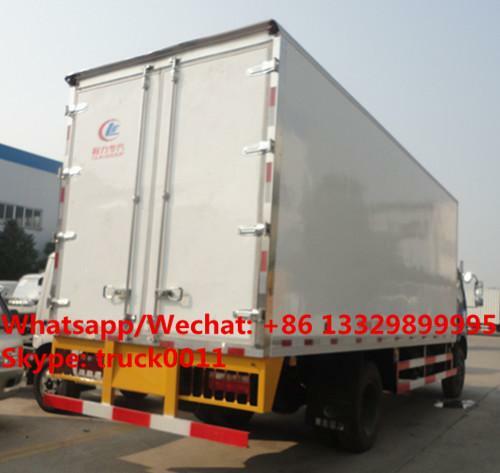 More pictures of Dongfeng brand RHD 6tons meat hooks refrigerated truck manufactured by Chengli Special Automobile Co., Ltd. as below. 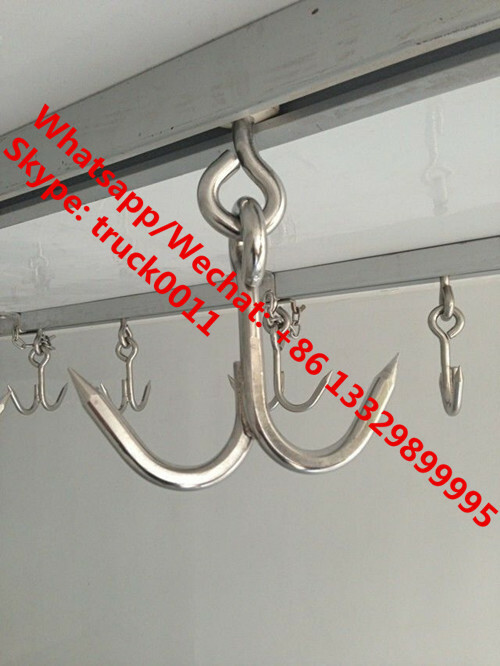 high quality 50 units of stainless steel double sides’ meat hooks and three slid guides on the roof top. 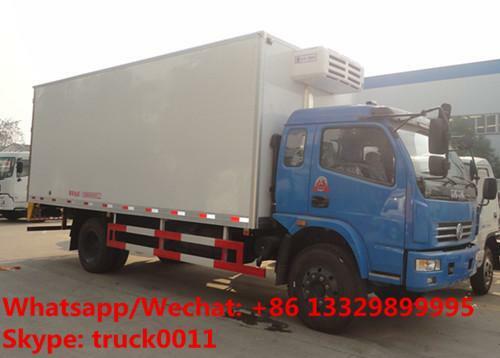 main technical parameters of dongfeng new refrigerated truck with meat hooks for transporting fresh meat manufactured by Chengli Special Automobile Co., Ltd. as below. Box Floor Baseboard adopts anti-skipping diamond board, which assuring the insulation ability and the compact resistance of the baseboard. Meat hooks There will be 50 units of stainless steel double sides’ meat hooks and three slid guides on the roof top. Hanya brand frozen cooling unit-DM-450C, the temperature can be adjusted from 0℃ to -18℃. And the cooling unit can be adjusted at the driver cab. Remark For long distance’ transportation, we just suggest the client to install aluminum alloy vent slots on the baseboard.